It’s time already for our third tutorial! Are you staying caught up so far? 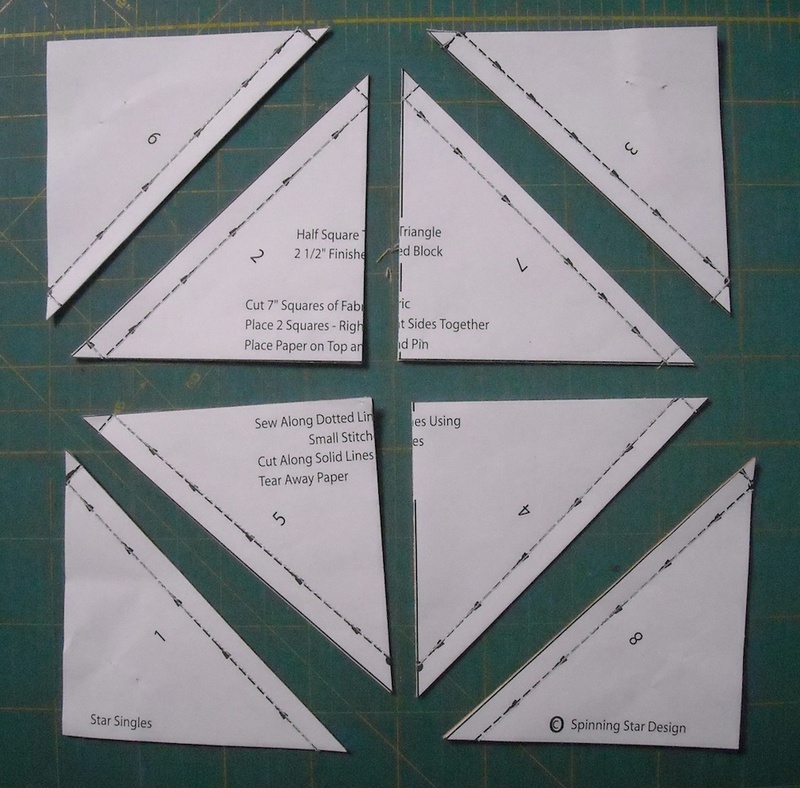 This week, we’ll be using Star Singles papers to make our triangle-square units. 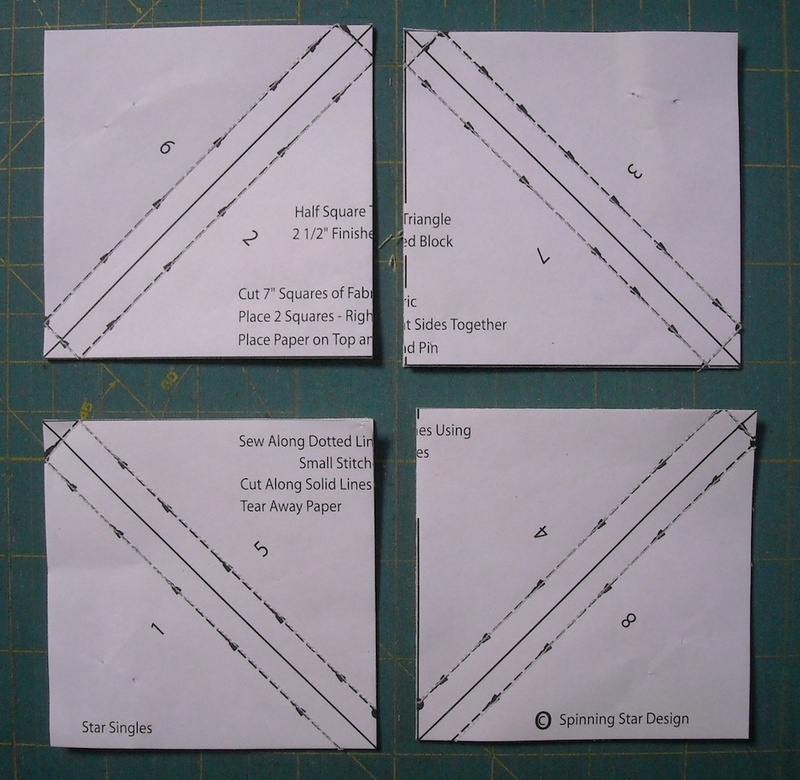 I’m using 2 1/2″ Star Singles, which means that the finished units in my final quilt will measure 2 1/2″. The units unfinished will measure 3″ square. 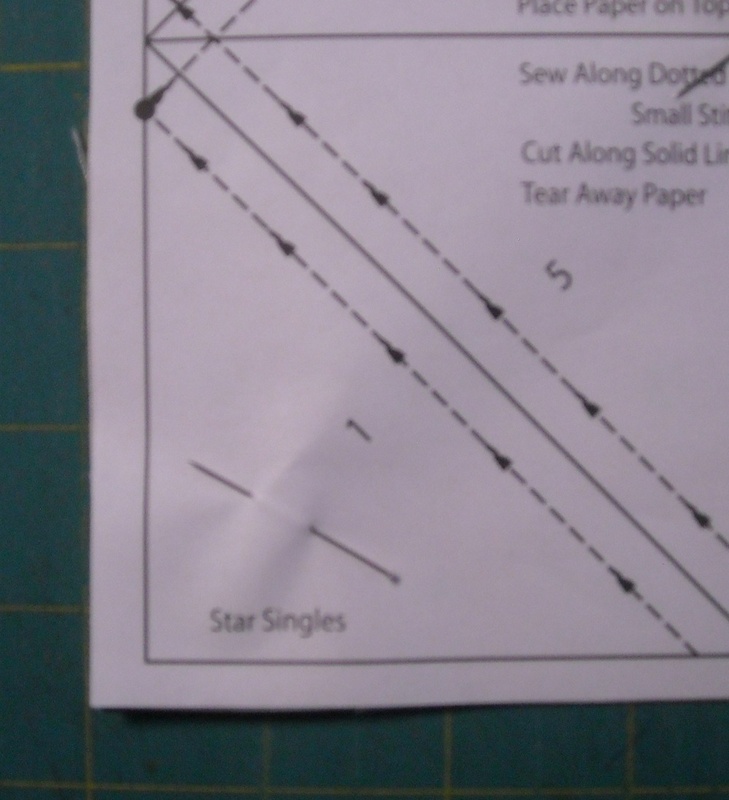 If you don’t have any Star Singles papers, you can go back to either Tutorial #1 or Tutorial #2 and use the formulas provided to make your units in the correct size for this week (2 1/2″ finished). If you have the papers, and would like to use them, here we go with the step-by-step! 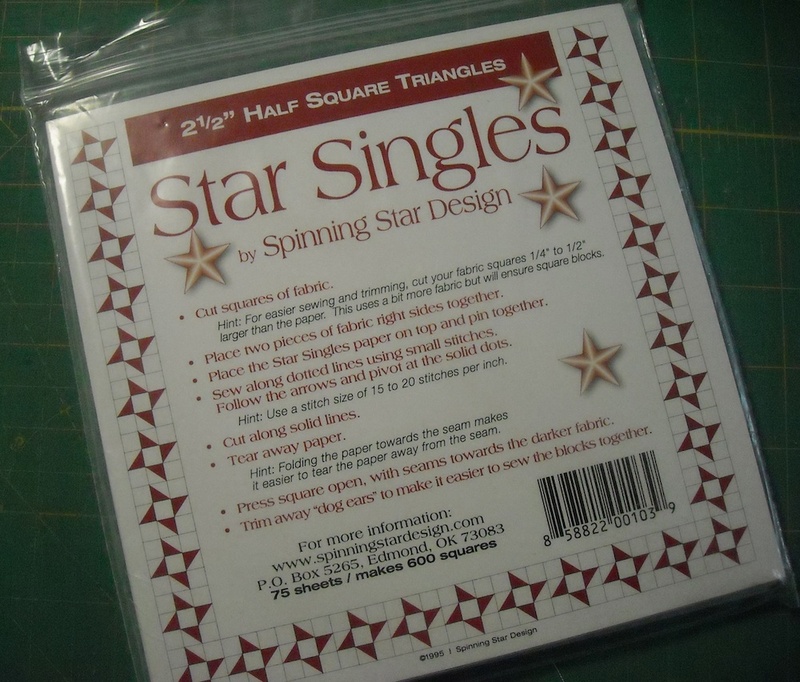 It says right on the front of the Star Singles package, and on the front of each sheet, the basic instructions for using them, so you can’t go wrong because the instructions are always right under your nose! Match them up, right sides together, and lay the Star Singles paper on top of them. Pin in place. 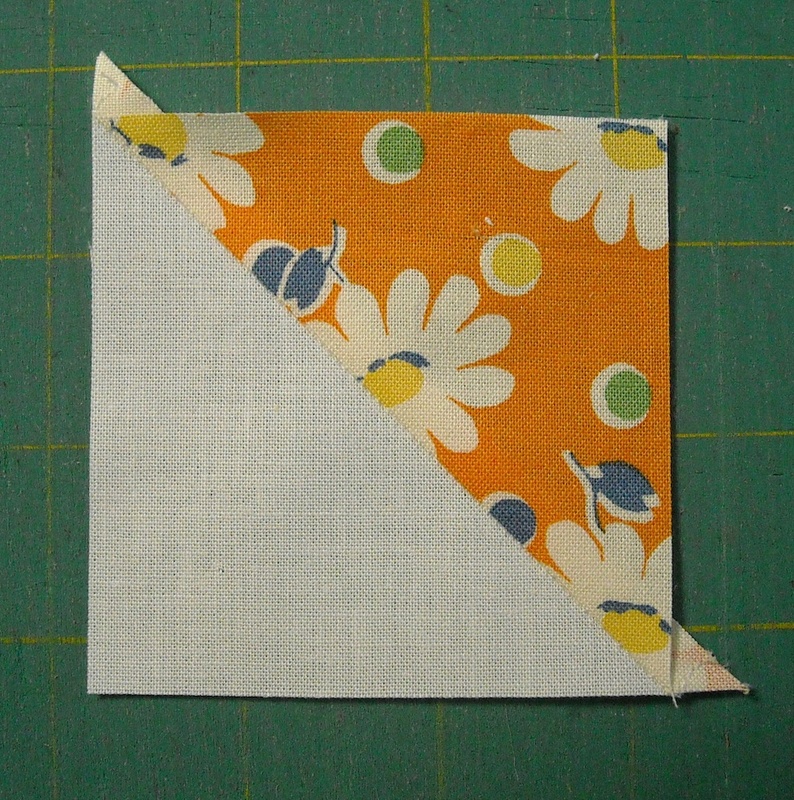 I used 5 pins — one in the center, and one in each corner — to keep it from shifting while I’m sewing on it. Locate the line numbered “1” on the paper. 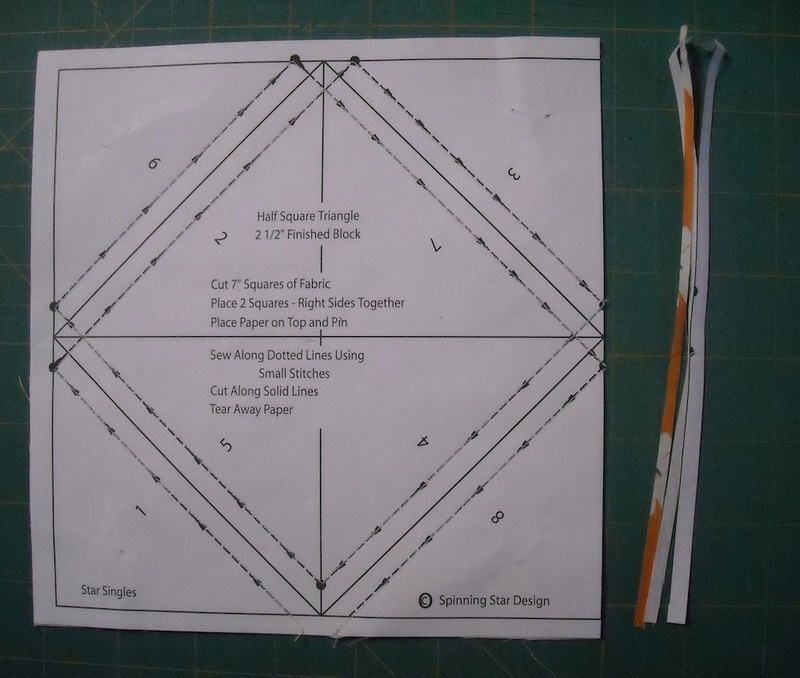 This is where you will begin sewing. 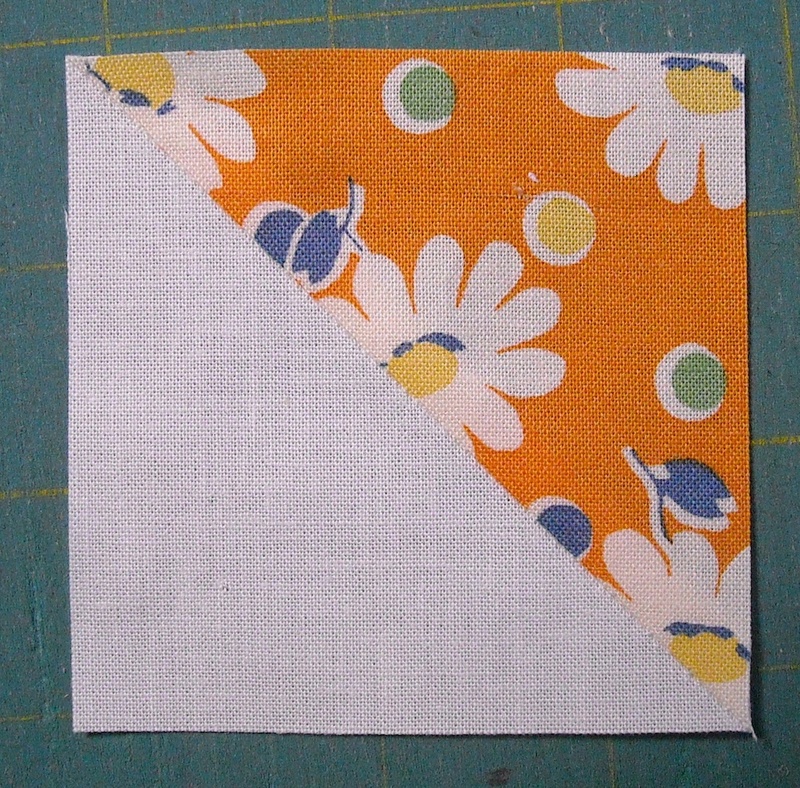 You will want to sew with a bit smaller stitch length, to make the paper easier to tear off when you’re finished. 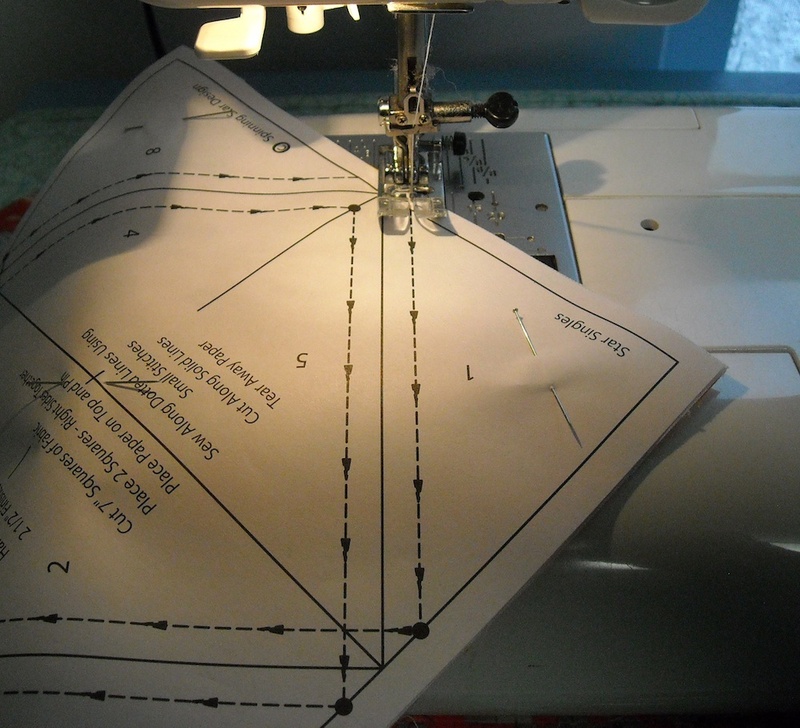 The Star Singles folks recommend 15-20 stitches per inch, so adjust your machine accordingly before you begin sewing. 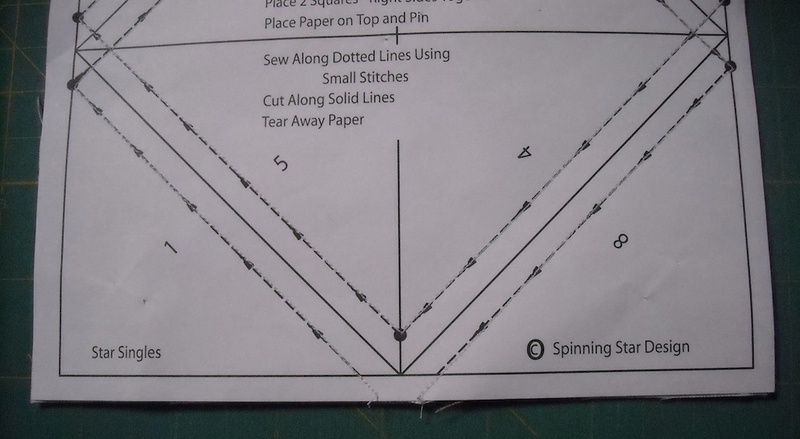 Sew on the dotted lines in the direction of the arrows, stopping at the large dots with the needle down. 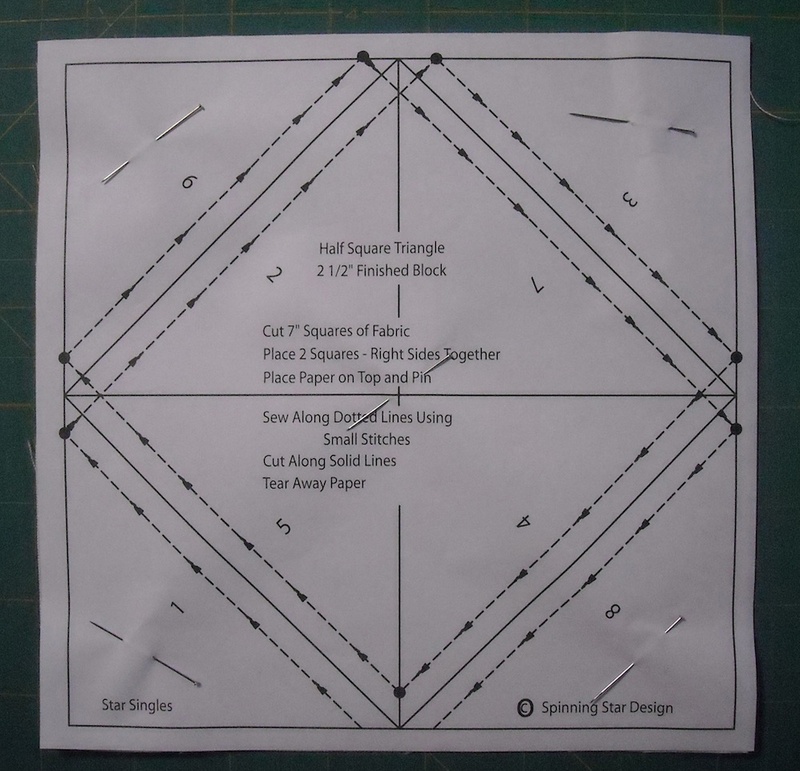 Pivot at the dot and continue sewing on the lines in numerical order until you have covered all the dotted lines with stitching. Remove the pins. Now it’s time to trim and cut. The first trimming you will do is around the outside edge of the entire thing. If you don’t make this first trimming, some of your units will not come out the correct size, so don’t forget this important first trimming step. 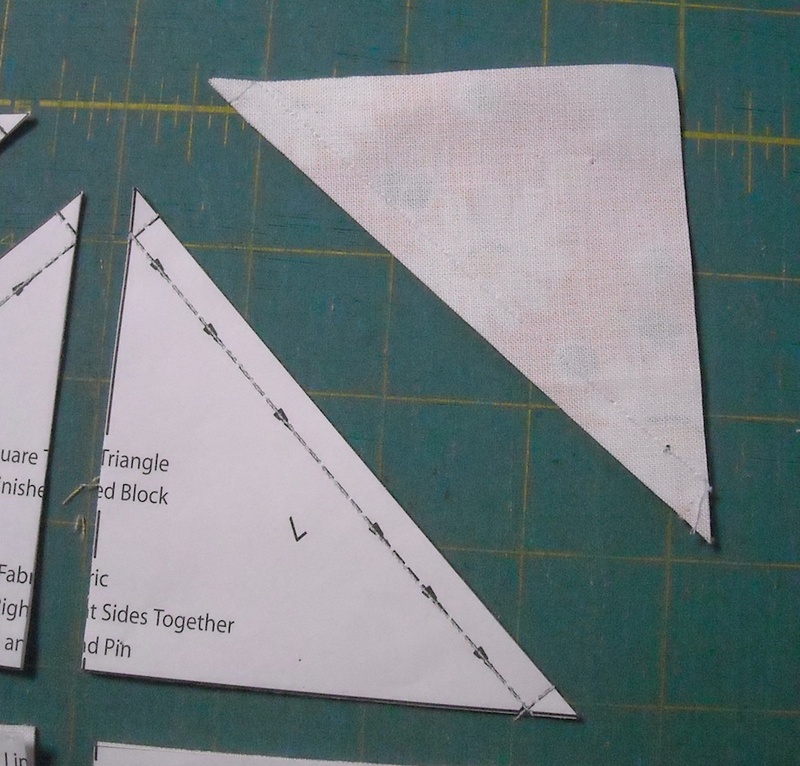 And you’ll have 8 identical half-square triangle units! Ta-da! There’s no formula needed for this method. 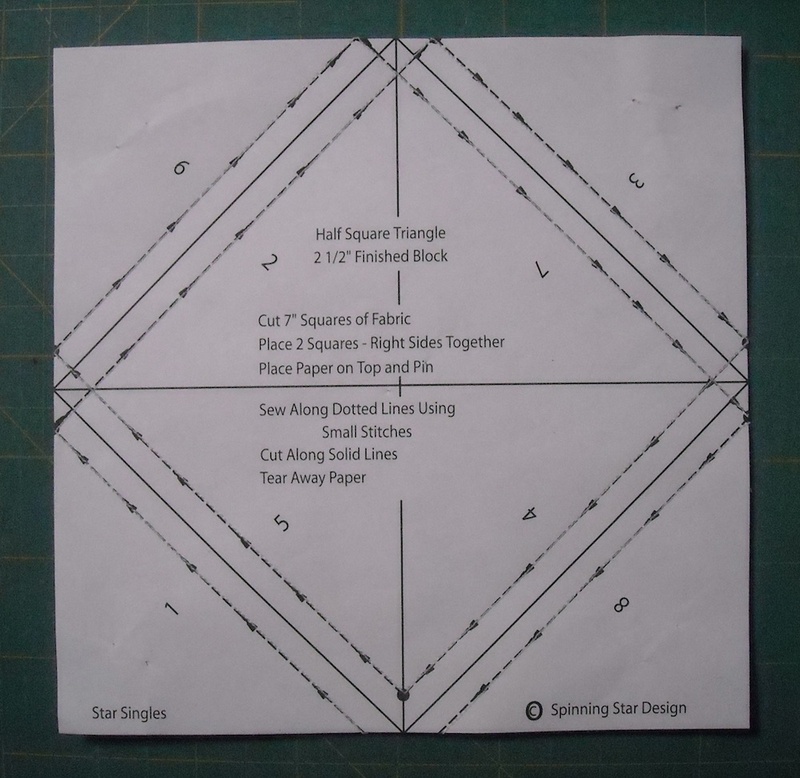 Simply choose the appropriate size of Star Singles papers, and it says right on the front what size squares to cut! If you need a lot of units, and it doesn’t matter if there are several that are all alike, this is a great method to use. If you need extreme variety in your project, and don’t want 8 units all alike, you’ll want to choose a different method. 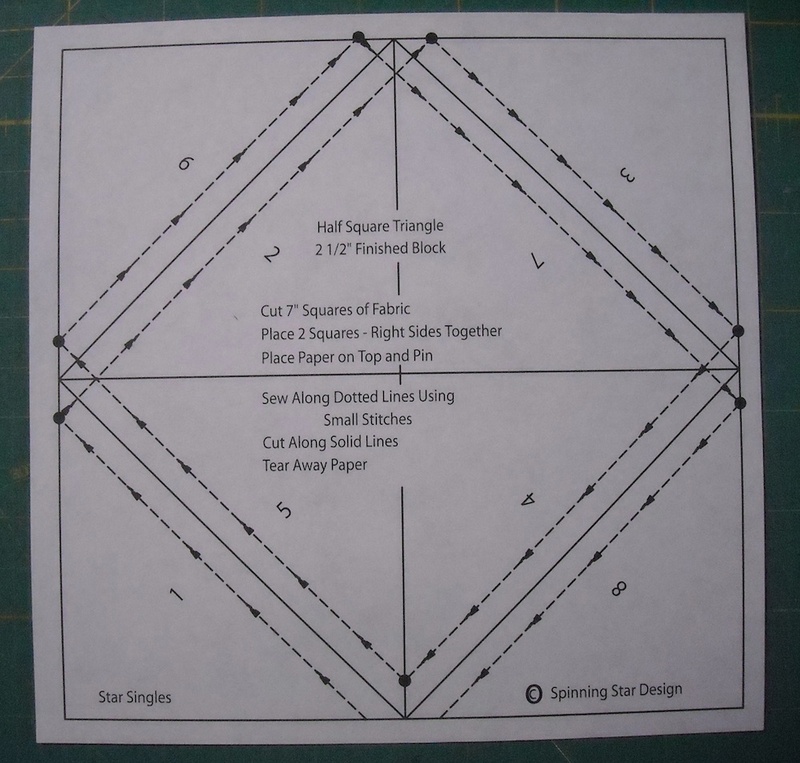 For the Triangle Salad quilt, the units we need this time should measure 3″ (unfinished), to finish at 2 1/2″ in the quilt, which means you need to use the 2 1/2″ Star Singles papers (see the first picture in this post for what the package looks like). 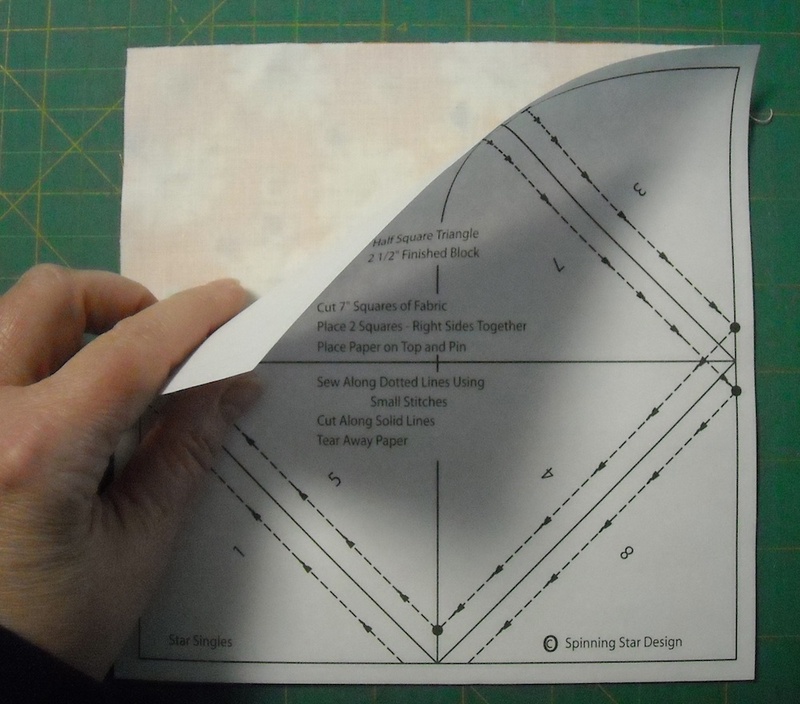 You will need to make 32 units using a print fabric with a background fabric. So this means you need to do the above process four times, using a different print with your background fabric each time. 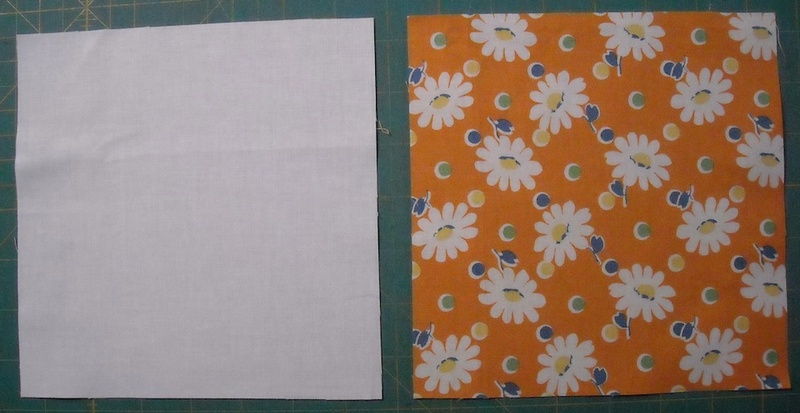 You will need to make 24 units using two print fabrics together. So this means you need to do it 3 times using 2 different print fabrics each time. 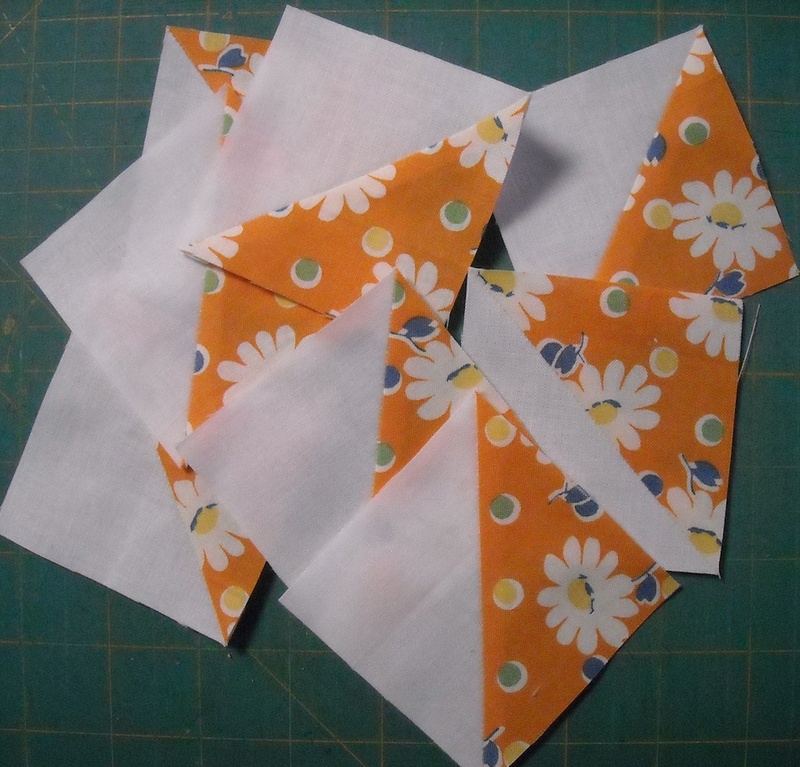 Store these 56 finished half-square triangle units in one of your ziplock baggies, and stick in with them the label that says 2 1/2″ Finished. Have fun! I’ll be back next Monday with Tutorial #4! Just found your blog today, 1/1/2016. The name intrigued me as my mother’s name is Hazel Ilene. She was born in 1930 and grew up in rural West Virginia. She also spelled Ilene the same as your “Hazel” . She is a third generation quilter; I’m the fourth generation. Don’t think that there will be a fifth though. I’m working on Tutorial #3. But because of disadvantage #1, I am using the common method as described in Tutorial #1. I do love these papers, but don’t have any right now of the correct size.